Frozen Fiefdom - AFFIDAVIT OF SHANNON MARIE MCCORMICK, My Former Best Friend As with the other affidavits, I'll do a line item review when I have time. Sloppy prep work by Mr. Grant's office has produced Shannon's Affidavit bearing a line at the bottom of the pages stating that it is that of Anna Sanders. Garbage In, Garbage Out! How timeless that line remains... Shannon does tend to exaggerate some things at times, and under 2. of her affidavit she states that we have known each other our entire lives. Untrue, as she lived in Juneau and I lived in Douglas, AK, so we went to different elementary schools. Shannon is a year older than I am, and we got acquainted when she and another Juneau girl would be hanging out with my older brother and his dirt bike riding group of friends. We became friends when I was 14, and her email to me in 2007 announced her wish to end our friendship. I was 43, so that equals 29 years of friendship. I also noted that some of her statements in this affidavit appear to conflict with the details which she wrote to me in emails approximately one year ago, and can be seen under the "Emails To / From Shannon" section. As I reviewed Shannon's Affidavit, I noted the high degree of her notations of dates, places, times, and that her contact with others was listed in a very methodical and step by step arrangement. Shannon has historically remembered much, and is always very aware of her surroundings, suspicious of the movements and actions of others, and is constantly analyzing people and their behaviors. One of her favorite activities is "People Watching" and trying to figure out why people are doing anything at any given time. It's a habit that became much more intense after she began working for the Alaska State Troopers as a Dispatcher, years ago. Some of her statements are written in the present tense, which raises the point that these statements of hers were prepared some time ago, and not recently. That sounds a bit staged to me, and very planned, which fits in well with my statements to Shannon back in the Fall of 2007 that "Something's Up" with my family, and I was going to figure out what it was, and I had apologized to her for them dragging her into their charade. 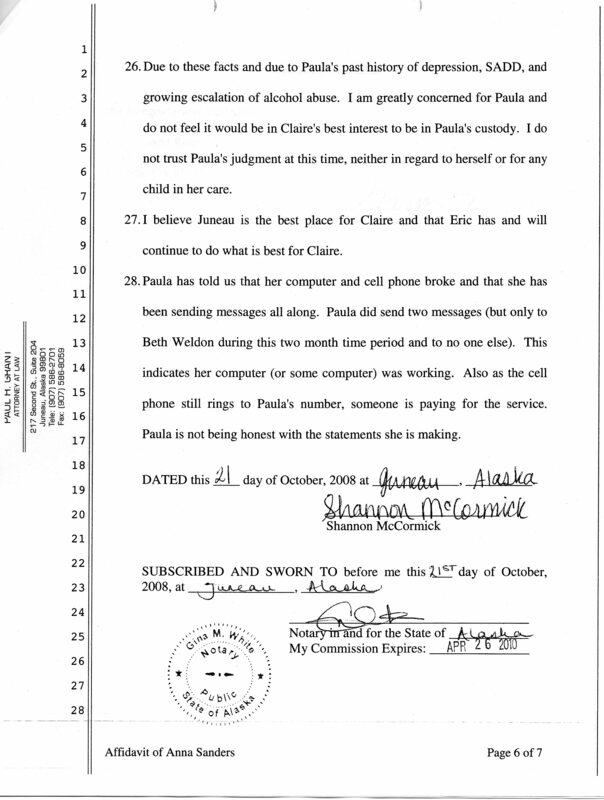 Item 17., final sentence states clearly "All of us were seriously concerned for Paula's well-being and have maintained daily contact over the last 2 months in regard to Paula." Well, that's weird. What 2 months is she referring to? August and September 2008? or sometime during 2007? This affidavit is signed on October 21, 2008. And she had stated in her November 7, 2007 email to me that I had been out of contact with "everyone" for a 3 month period, again which she never specified. Item 19. is especially interesting. Shannon states that my father (that's Dad, T.J. Sanders under "Who Is, What Is?") was the person who offered to spring for a ticket for someone to come to L.A., to "check on me." Now, have a look at the Emails To / From Dad section and note that he never replied to my question about that which I asked him last winter. What's Dad hiding? He never mentioned this "gone missing" event to me, and refuses to answer my questions about his involvement or knowledge of who said what. Gail claimed that she popped in "just because" and on her own dime. Who's the liar here? My Dad, Shannon, or Gail? Shannon's is a sworn statement, and on this particular item, she might be fully correct. So perhaps my Dad will "Man Up" and answer my original question to him. He'll hear about this through the family vine, as he and I have elected to not communicate since the last email I posted from him. As I wrote in this story months ago, I know damn good and well that my sister Gail Sanders would NEVER EVER EVER in her life spring for her own ticket and car expenses to visit me. She arrived unannounced and uninvited, she said that she used mileage, and I expect she probably used a credit card for the car. If so, she would be fully expecting a cash reimbursement from someone. And at the family gathering in the Keys for birthdays in September 2007, Anna said to Gail when we were all in the living room one evening "did Dad ever pay for California?" Then she noticed that I had overheard. Item 26. Shannon's first line of this point mentions my "past history of depression, SADD, and growing escalation of alcohol abuse." It's a bit of The Pot calling the Kettle Black, as Shannon herself has those same issues, but substituted food as her substance to abuse. I hope that she has dealt with it, as obesity is known to cause a multitude of serious health problems. I have previously pointed out in this story that I was "A 'Sauce Queen' in a family known for knocking 'em back." It's in the "Disclaimer and Mission Statement" section, and the Crown is no longer mine. I haven't been depressed for years, which was mostly post partum stress, and no more SADD for me! It's amazing how much better life is, living in a sunny climate. Item 28. 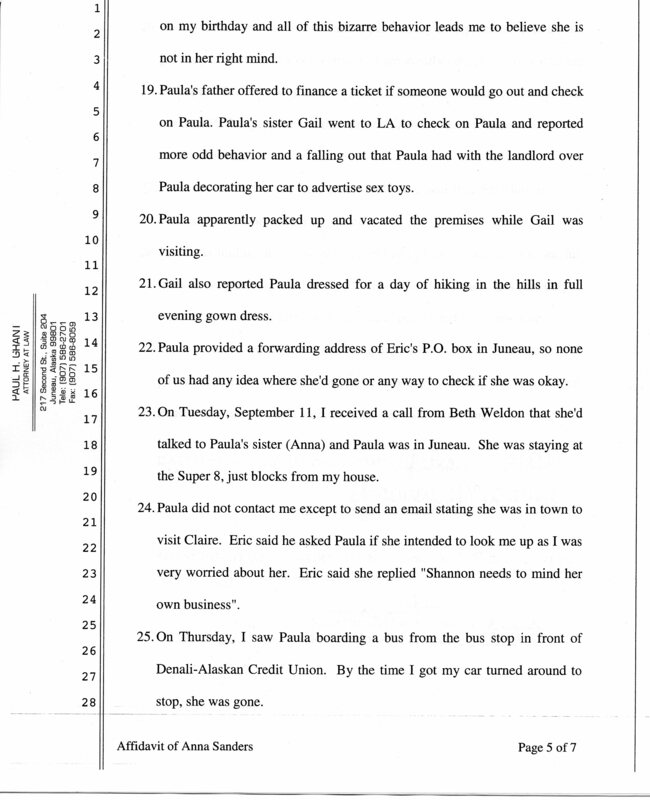 Again, Shannon speaks in the present tense with her statements: "Also as the cell phone still rings to Paula's number, someone is paying for the service. Paula is not being honest with the statements she is making." You bet "someone" was, and is, paying for the service, and it was / is I. Of course, my provider would have my payment records, and a phone line will ring even if the actual phone is turned off, broken, dead battery, or is having some other technical malfunction. I bought a new phone in September of 2007, and have a new number, which I emailed to her last fall, and she acknowledged receipt of. I'm not sure what she mean by her last sentence in Item 28, but I see false statements in her Affidavit. Shannon's Affidavit are her recollections, and opinions. Her statements are so detailed, they appear to be scripted. The inaccuracies and conflicting details, use of present tense in some instances, suggest that these statements were scripted, and prepared some time ago. Shannon does tend to exaggerate some things at times, and under 2. of her affidavit she states that we have known each other our entire lives. Untrue, as she lived in Juneau and I lived in Douglas, AK, so we went to different elementary schools. Shannon is a year older than I am, and we got acquainted when she and another Juneau girl would be hanging out with my older brother and his dirt bike riding group of friends. We became friends when I was 14, and her email to me in 2007 announced her wish to end our friendship. I was 43, so that equals 29 years of friendship. I also noted that some of her statements in this affidavit appear to conflict with the details which she wrote to me in emails approximately one year ago, and can be seen under the "Emails To / From Shannon" section. As I reviewed Shannon's Affidavit, I noted the high degree of her notations of dates, places, times, and that her contact with others was listed in a very methodical and step by step arrangement. Shannon has historically remembered much, and is always very aware of her surroundings, suspicious of the movements and actions of others, and is constantly analyzing people and their behaviors. One of her favorite activities is "People Watching" and trying to figure out why people are doing anything at any given time. It's a habit that became much more intense after she began working for the Alaska State Troopers as a Dispatcher, years ago. "Something's Up" with my family, and I was going to figure out what it was, and I had apologized to her for them dragging her into their charade. Item 17., final sentence states clearly "All of us were seriously concerned for Paula's well-being and have maintained daily contact over the last 2 months in regard to Paula." Well, that's weird. What 2 months is she referring to? August and September 2008? or sometime during 2007? 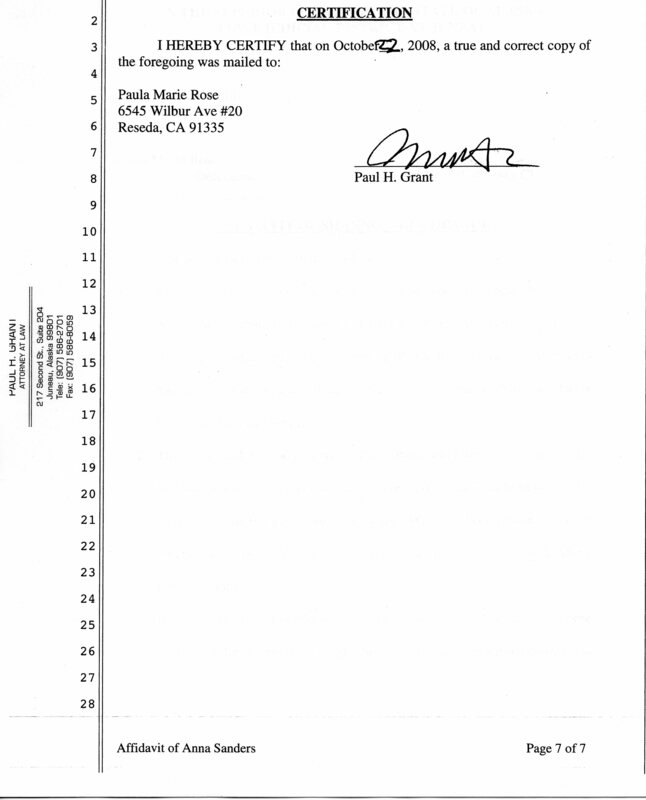 This affidavit is signed on October 21, 2008. And she had stated in her November 7, 2007 email to me that I had been out of contact with "everyone" for a 3 month period, again which she never specified. Item 19. is especially interesting. Shannon states that my father (that's Dad, T.J. Sanders under "Who Is, What Is?") was the person who offered to spring for a ticket for someone to come to L.A., to "check on me." Now, have a look at the Emails To / From Dad section and note that he never replied to my question about that which I asked him last winter. What's Dad hiding? He never mentioned this "gone missing" event to me, and refuses to answer my questions about his involvement or knowledge of who said what. Gail claimed that she popped in "just because" and on her own dime. Who's the liar here? My Dad, Shannon, or Gail? Shannon's is a sworn statement, and on this particular item, she might be fully correct. So perhaps my Dad will "Man Up" and answer my original question to him. He'll hear about this through the family vine, as he and I have elected to not communicate since the last email I posted from him. As I wrote in this story months ago, I know damn good and well that my sister Gail Sanders would NEVER EVER EVER in her life spring for her own ticket and car expenses to visit me. She arrived unannounced and uninvited, she said that she used mileage, and I expect she probably used a credit card for the car. If so, she would be fully expecting a cash reimbursement from someone. And at the family gathering in the Keys for birthdays in September 2007, Anna said to Gail when we were all in the living room one evening "did Dad ever pay for California?" Then she noticed that I had overheard. Item 26. Shannon's first line of this point mentions my "past history of depression, SADD, and growing escalation of alcohol abuse." It's a bit of The Pot calling the Kettle Black, as Shannon herself has those same issues, but substituted food as her substance to abuse. I hope that she has dealt with it, as obesity is known to cause a multitude of serious health problems. I have previously pointed out in this story that I was "A 'Sauce Queen' in a family known for knocking 'em back." It's in the "Disclaimer and Mission Statement" section, and the Crown is no longer mine. I haven't been depressed for years, which was mostly post partum stress, and no more SADD for me! It's amazing how much better life is, living in a sunny climate. Item 28. 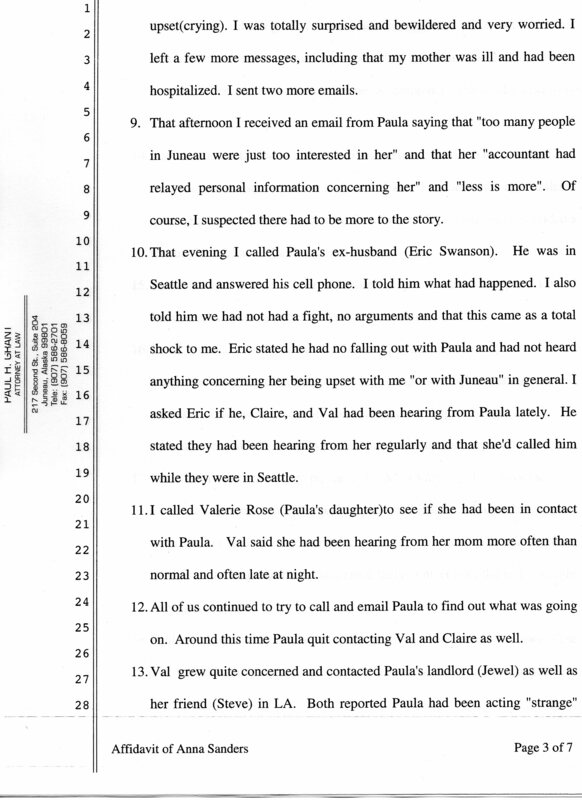 Again, Shannon speaks in the present tense with her statements: "Also as the cell phone still rings to Paula's number, someone is paying for the service. Paula is not being honest with the statements she is making." You bet "someone" was, and is, paying for the service, and it was / is I. Of course, my provider would have my payment records, and a phone line will ring even if the actual phone is turned off, broken, dead battery, or is having some other technical malfunction. I bought a new phone in September of 2007, and have a new number, which I emailed to her last fall, and she acknowledged receipt of. I'm not sure what she mean by her last sentence in Item 28, but I see false statements in her Affidavit. Shannon's Affidavit are her recollections, and opinions. Her statements are so detailed, they appear to be scripted. The inaccuracies and conflicting details, use of present tense in some instances, suggest that these statements were scripted, and prepared some time ago.